Jump City’s Pretty Princesses Palace Combo Jump, Rock Wall Climb and Slide! 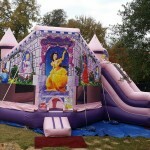 Combo Inflatable Bounce House, Rock Wall and Slide! It’s a great item to have for cooperative players! It is ready for your children’s Party, or event. Rent one for your party today!